LOP App – Lists o’ Plenty is Now on Your iPhone !! LOP – Lists o Plenty - iPhone/iPod Touch App is here! 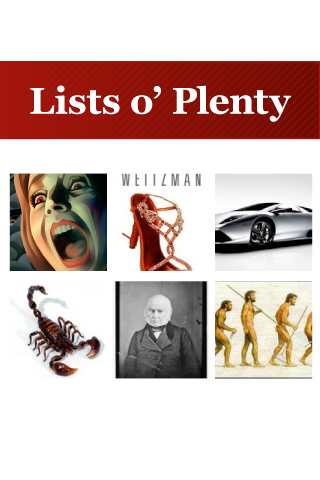 Lists o Plenty is now available in app for your iPhone or iPod Touch. Take it with you wherever you go and enjoy a nice list or some pix; even access Random News through Fax o Plenty. Free to download and no ads – nice…hey, it doesn’t have to be a whiz-bang game to be a cool app. Download from the iTunes store today ! This app will work on your iPhone or iPod Touch, and also features the sister site for images� – Pix o Plenty, as well as the Random News to keep you up to date with Fax o Plenty. Enjoy the o’ Plenty Publishing team wherever you go. Best of all – it’s free and no advertising ! App Lop - beaucoup o listes est maintenant sur votre iPhone!